Discover a more effective, real-time way to manage your time in Smartsheet. Time management involves organizing and planning your time so you can get the most out of your days and accomplish your goals. If you’re struggling to balance work and life demands, a few simple tools can help you feel less overwhelmed and ensure that you don’t overlook important tasks - sometimes a simple “to-do” list is all you need in order to plan your day. Time management can also help you set goals, beat procrastination, prioritize responsibilities, and even analyze your current time usage so that you can quickly change practices that eat up your time. Assessing how you spend your time or planning a weekly schedule might just sound like additional time-consuming tasks. However, a little prep work can go a long way toward boosting efficiency and saving time - not to mention reducing stress once you have a greater sense of control over how you use your time. Whether you’re a student, professional, parent or all three, your responsibilities and priorities may change from month to month and year to year. Utilizing time management tools consistently can help you adjust your schedule to better accomodate your life demands and ensure that you are staying focused on your short- and long-term goals. Remember, the purpose of time management is not to get as much done as possible in the shortest amount of time; rather, it’s to ensure that time is being used wisely so that important tasks are getting the time and attention they need. To help you get started, check out the free, customizable templates that you can download or print. All of the templates offer simple formatting with a professional appearance. You’ll find schedule and calendar templates, time management spreadsheets for Excel, and worksheets for Word and PDF. Determine which activities are fixed vs. flexible. This will vary for each individual, but some items on your schedule are fixed, meaning that they will occur at the same time each week. Others will occur occasionally or have flexibility around when they can be scheduled. Fixed events may include work hours, classes, meetings, mealtimes, church, children’s activities, and hours spent commuting. Flexible items could include time allotted for exercise, household chores, appointments and errands, entertainment, and down time. Be realistic about how much time you need. Planning out your schedule can help ensure that adequate time has been budgeted for required activities. Having a plan prevents you from having to rush, and also reminds you not to spend too much time on tasks that you can accomplish quickly. Break tasks down into manageable segments. Some projects are complex and involve multiple steps. Scheduling each step separately can provide a series of manageable goals to accomplish. A schedule provides a helpful guide, but establishing consistent habits makes it easier to maintain productivity. Just as healthy eating habits can support wellness, effective time management habits can support a sense of confidence and ease. Compensation for time well spent can include scheduling weekend time to ensure that you really get time to relax. If there’s something that motivates you more, use that as an incentive to reward accomplishments. Be flexible, but don’t get derailed. Unexpected events will always arise, and you can adjust your schedule to accommodate them by utilizing free time. After a shift in scheduled time occurs, return to your plan in order to stay on track. Group tasks to maximize efficiency. You can group errands by location and priority, and arrange tasks by type. Embrace multi-tasking by combining activities that work well together. For example, complete laundry while doing other household chores or homework. Following the natural cycles of your body can help you create an effective schedule. If you’re a morning person, for instance, you may have more energy for certain things earlier rather than later in the day. You may have a job or school schedule that doesn’t exactly match your natural rhythms, but being aware of your energy levels throughout the day can help you anticipate how much time you may need for a given activity. In work or family life, find duties that you can delegate or share with others to help alleviate your workload. While you may give up some control by sharing tasks with others, you may also discover that you have more time to focus on high-priority items and those personal goals that matter the most to you. Whether you’re focusing on short-term action steps or long-term goals, use these objectives for motivation. This can help you stick to your time management schedule and foster a sense of achievement. There are many time management tools that you can use to help schedule time, from mobile apps to calendars and multi-year plans. Below, you’ll find a variety of templates with basic formatting and a professional appearance that can help you manage your personal and professional time better. Download the templates that work for you and customize them to fit your needs. An activity log provides a record of how you are spending your time on a daily and weekly basis. Similar to the time study template above, this time management spreadsheet captures all of your tasks in one place so that you can see exactly where your time is going. This Excel template is intended to record your full day, not just work hours. To use the template, keep track of all your activities over a period of time, and then assess how your time is being spent and where you’d like to make changes. When you create a financial budget, you subtract expenses from income and evaluate the difference. For a time budget, subtract all the time spent on various activities (including sleep and personal time) from the 168 hours available in a week. This time budget template is a quick tool for assessing your time management and working toward a balanced schedule. This Excel template provides a visual representation of how hours are spent. The resulting chart can be a useful tool for presentations, communicating with coworkers, or just getting a high-level overview of time usage. 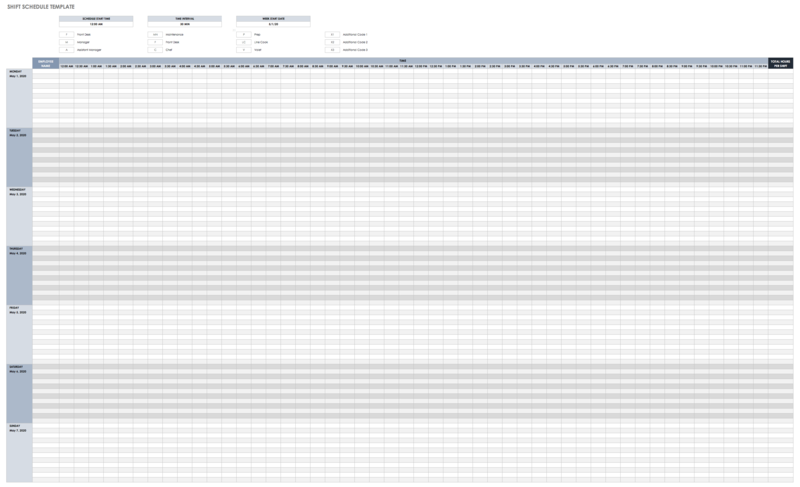 Enter your data, and the template will translate the information into a chart for easy reference. This time management sheet allows you to track your time usage along with the priority, status, and due dates of each task. You can modify the spreadsheet to include any additional information, and use the “Comments” column to record notes, provide instructions, or add important reminders. 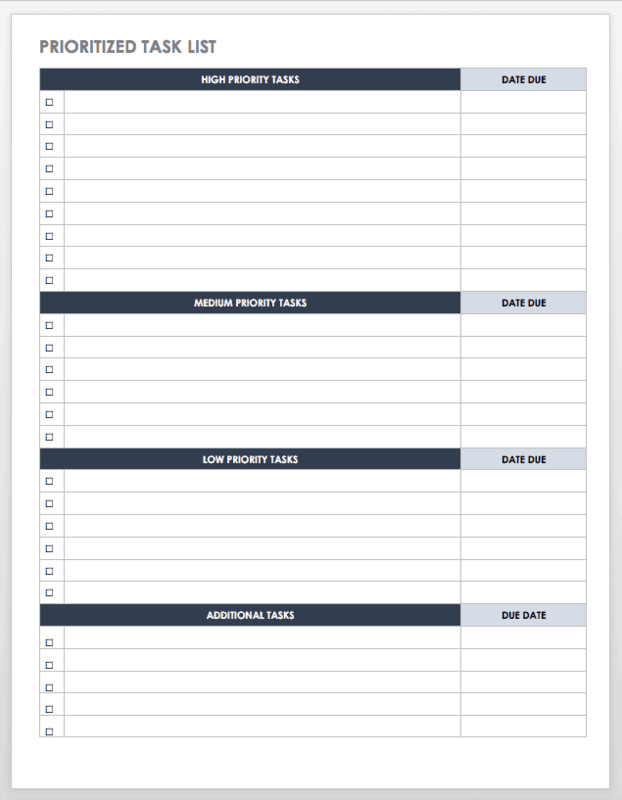 This template is helpful for organizing your to-do list or for creating a log of completed and pending tasks. You can use this daily planner template for comprehensive, daily schedule planning. Hours are broken into 15-minute intervals so you can also break down tasks into smaller steps. There is also room to highlight important tasks that you want to remember and write notes. This is a versatile planner that you can use for personal or business purposes. Time management schedules are important workplace tools that help facilitate communication among employees, attendance tracking, and payroll calculation. 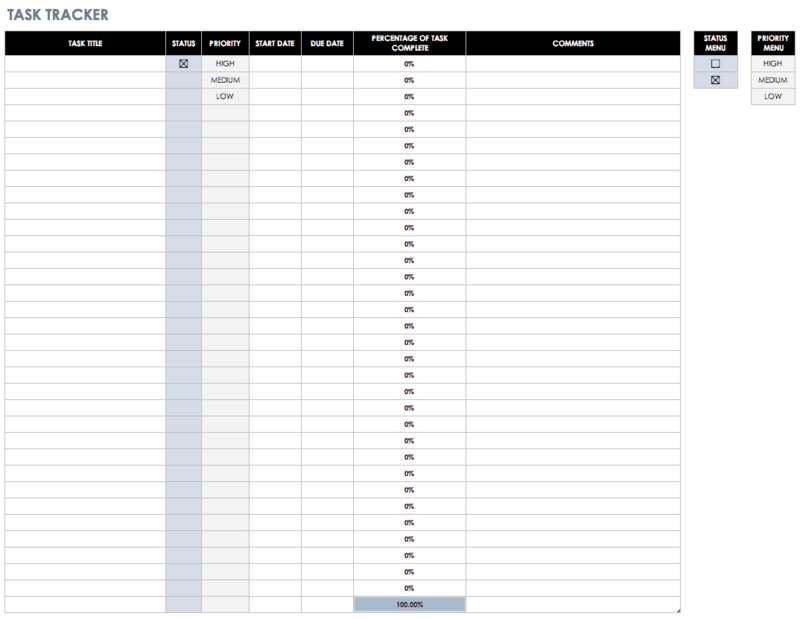 This template provides a weekly spreadsheet for managing multiple employee schedules. For each day of the week, enter each employee’s name and where they will be working during specific hours; the template will then calculate total hours completed. Time management sheets work for any situation that involves a series of tasks, including planning for a business trip. 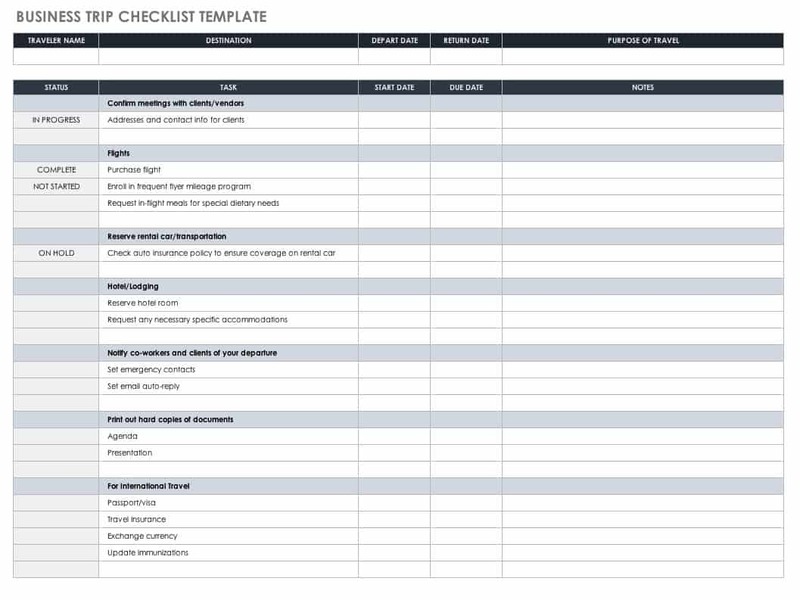 This checklist template provides sections for managing each step of travel planning, and you can easily be edit the list to include whatever details are pertinent to your trip. This time management calendar covers three months (90 days) on a single sheet, and also includes space for additional notes. A 90-day calendar may be useful for project planning, creating a schedule for a college semester, planning your summer months, and more. The template makes it easy to view your schedule for the extended time period at a glance. 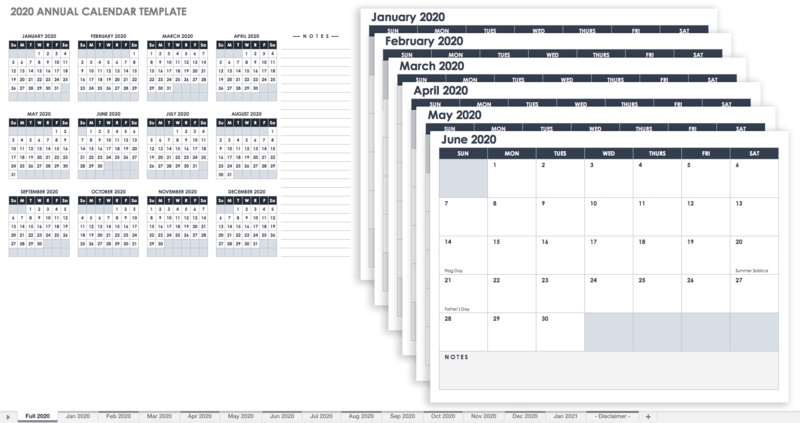 If you need a full-year calendar template, this Excel version provides all 12 months in a simple layout that is easy to view and modify. You can use the yearly calendar template for long-term planning while tracking your weekly and monthly schedules. Set both short- and long-term goals, and use the calendar to plan your steps toward meeting those objectives. You can use this template to manage daily and weekly shift rotations among employees. The schedule template provides a simple grid for entering the shift type or location for a given time period. You can quickly get a broad overview of the schedule as well as precise work details for each employee. Simply edit the shift descriptions and hourly time intervals to match your business and scheduling needs. Keep track of work hour, used vacation and sick time, hourly rates, and income due with this weekly timesheet template. Hours and pay are calculated for each day, and a weekly total is provided as well. You can also modify the template to create a monthly timesheet, project timesheet, or to include additional information. Project management encompasses a range of responsibilities, from planning and scheduling to managing a team and producing specific outcomes. 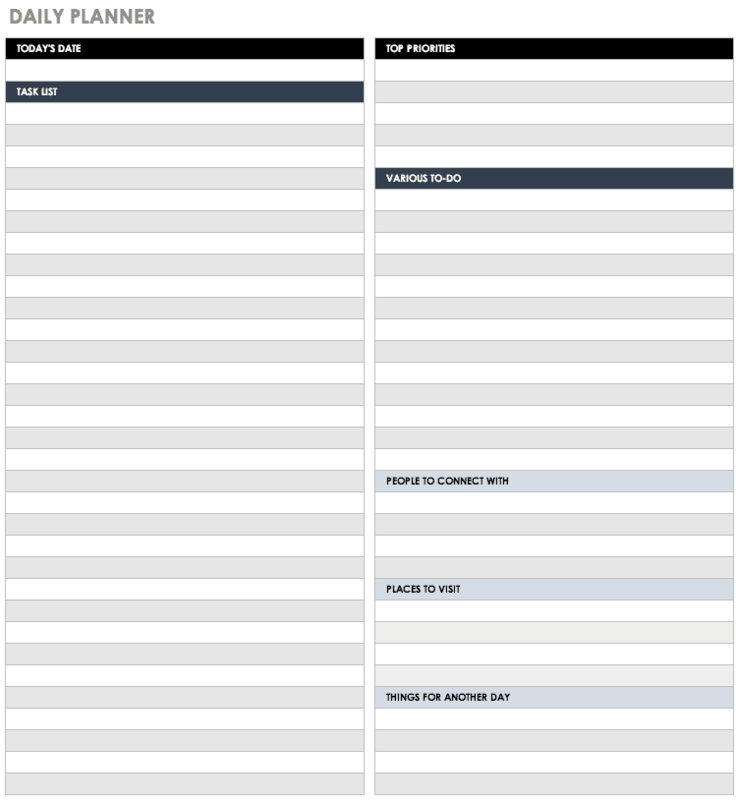 This project schedule template is designed to help managers streamline the planning process and track each stage of a project. Create a Gantt chart so that tasks and dependencies are easy to view, and you’ll end up with a detailed project timeline that provides a quick overview of monthly, quarterly, or annual progress. Create a weekly review with this Excel evaluation template. Assess task progress and use this information to plan your schedule for the following week. Employees can also use this template to create a simple report for managers. This is an easy way to mark successes while also keeping track of incomplete items. Anyone can use this template to create a master 10-week schedule, but students may find it particularly useful for semester planning. The 10-week calendar provides a blank slate for adding whatever activities and due dates you need to track. Planning a schedule over a longer time frame can provide a greater sense of organization and help you work toward longer-term goals. You can also practice effective time management in your home life, including with your chore schedule. 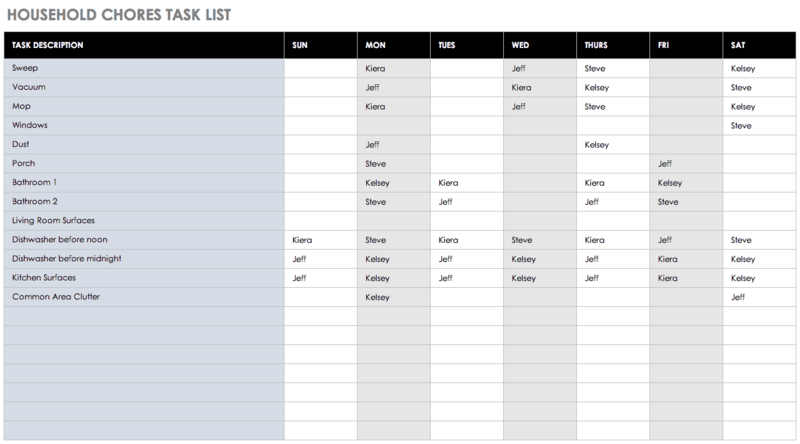 On this template, you can add a brief description of each chore along with the person responsible for completing it on a specific day. This simple spreadsheet is useful for families or shared houses with roommates who need to manage a rotating chores schedule. This four-year template was designed with college students in mind, and provides sections for each year of school. Plan out which classes you intend to take and the number of credits needed for graduation. With this template, you get a broad overview of your semester, yearly, and four-year plan, which gives you an idea of your course load and helps ensure that you don’t overlook any graduation requirements. You can use this Excel template to conduct a workplace time study, tracking how much time is being spent on certain tasks. Record all tasks in the first column, and then add the number of minutes spent on each item for each day. Fill out this template throughout the day to ensure accuracy, and be sure to include break times or unexpected activities that arise. At the end of the week, you’ll know the frequency and duration of interruptions. Whether you’re adjusting to the demands of college life and living away from home or approaching graduation with too many tasks to manage easily, a class schedule can help you establish a weekly routine and stay on top of responsibilities. Choose the start time for your day, time interval, and the week’s starting date, and then enter your daily class schedule along with any other appointments, activities, or deadlines. You may also want to dedicate certain hours to studying to make sure you have adequate time set aside. Use this timeline template to create an organized weekly schedule for your study group. You can plan study sessions based on upcoming assignments and tests by tracking deadlines and relevant course content. This template also creates a log of study group meetings so that you can track previous activities and meeting dates. This template lists classes for each week day so that you can create a homework schedule, manage study time, and plan for upcoming due dates. Keeping track of all your assignments in one spreadsheet can give you an idea of how much time you need to devote to homework on a given day or week. You can edit the template for your specific classes, and adjust the dates. Prioritizing tasks can help ensure that important items get done. This simple template in Word format makes it easy to create a hierarchical list, with high-priority tasks at the top and low-priority items at the bottom. If you have many high-priority items to accomplish, consider creating an "If I finish everything else" list - items you would like to accomplish, but that can wait until you complete all necessary tasks. This template is ideal for setting goals and determining strategies for reaching them. Individuals can use this worksheet to better understand their personal goals and what might be getting in the way of reaching them. In a business setting, use this worksheet to identify measurable goals, required resources, and action steps for success. The template can also be used for identifying Key Results Areas (KRA) - the outcomes for which an employee or department is responsible - and plans for achieving those results. Determining specific goals in this manner makes it easier to create a prioritized list of action items. Even if you have evaluated your schedule, set attainable goals, and created a long-term plan, you may still find yourself procrastinating. This worksheet can help you identify which activities you tend to put off or avoid altogether. Knowing what areas of your life are most affected by procrastination can provide insight into why you might be neglecting certain tasks and what you can do to change this. A meeting agenda may not be an obvious time management template, but it can help keep a meeting on schedule and ensure priority issues get addressed. With this template, you can set a duration for each agenda item, and assign a timekeeper (who monitors the agenda against time spent on items) to help presenters follow the predetermined schedule. This note-taking template follows the Cornell method. The sheet is divided into two columns - the left for recording questions and the right for taking notes. This creates a condensed and organized note-taking format that makes it easier for students to record and review notes. The template is in Word format and you can print it or email it to share with study group, club or meeting participants. Creating daily lists is a simple way to remind yourself of what needs to get done, whether you’re checking off appointments and errands, making a grocery list, or keeping track of responsibilities at work. You can also use this to-do list template to create a list of items that you are waiting for others to accomplish, such as work projects or requested services. Another creative use is to create a list of distractions that are keeping you from focusing on tasks at hand. Write down tasks or ideas that you want to tackle or remember so that you can stick to your current schedule. This timesheet is ready to print in PDF format and offers a bi-weekly record of employee hours. You can choose to include whatever info is relevant for the job (overtime hours, lunch breaks, sick leave, etc.). The template provides space for tracking the employee’s department and supervisor, as well as the pay period. Balancing a busy life requires efficiency. Luckily, there are several tools to help you manage your time effectively. One such tool is Smartsheet, which you can use to create weekly agendas, build reports, and manage appointments. Use a pre-built template to track to-dos and team work lists, set reminders and notifications, and assign tasks to keep work moving forward. Plus, easily toggle among Smartsheet’s flexible view-types - Gantt, Calendar, Card, and traditional grid - to view work the way you want. Smartsheet is a collaborative work management platform that enables enterprises and teams to work better. As a cloud-based solution, there’s nothing to install or update. Smartsheet's intuitive interface is easy for anyone to adopt, and the powerful collaboration features keep everyone on the same page. Discover a more effective way to manage your time with Smartsheet.